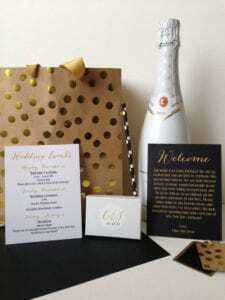 Welcome bags are a great way to welcome your out of town guests to your wedding! They give a personalized touch to the event and show your appreciation to your guests for traveling such a long way to be a part of your special day. A cute trend that we are just loving here at Magnificent Moments Weddings is city themed welcome bags! Many of your guests may have never visited the city you have chosen to get married in, so why not use this opportunity to show off your hometown and all that it has to offer! Today I am going to share 5 great items to include in your welcome bags that not only serve a great roll in terms of function but show off the Queen City and everything it has to offer! Since most out of town guests will arrive before your wedding festivities begin, why not include a fun card highlighting the city! There are all kinds fun things to do in The Queen City. For your guests who love museums, you could suggest a tour of the Mint Museum, the Nascar Hall of Fame, the Bechtler Museum of Modern Art, and the Levine Museum of the New South. For the foodies, you should tell them about the amazing salted caramel brownies at Amelies, or the great food experience at 7th street public market. Charlotte is also a great place for sports lovers – they can catch a Charlotte Knights game, Hornets game, or Panthers game depending on the season. You could then use the back side to remind them of all the wedding events planned, including location and time of your rehearsal dinner, shuttle pickup times, and of course, the time of your ceremony. North Carolina is home to some pretty great things including one of the tastiest sodas around! 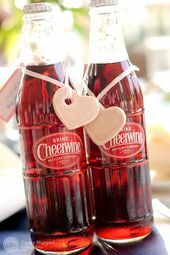 Cheerwine was invented in Salisbury, very close to the city of Charlotte, so include a cute glass bottle in your welcome bag. Your guests can have a refreshing drink and take in the taste of the state. Cheese and peanut butter may seem like an unappealing combination, but you would be surprised just how delicious they can be! 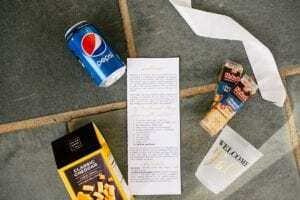 Introduce your out of town guests to this unique combination by including Lance Crackers in your welcome bag! These tasty treats come straight from Charlotte. Once they try them, I know they will be hooked on the odd combination. After a long night breaking it down on the dance floor at your reception, your guests may need a little relief the next morning. True southerners know the best cure for a hangover is a Goody’s Powder. 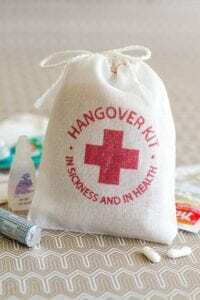 Include in your welcome bag a mini hangover kit complete with water, Visine, Chapstick and Goody’s of course. And while we are on the subject of recovering, why not help your guests out with a gift card to Bojangles! There is nothing in the world a Bojangles sweet tea can’t fix. 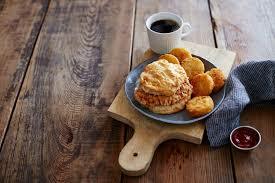 So give your guests the chance to enjoy a Cajun Filet Biscuit (my personal favorite) for breakfast on you the morning after your wedding. All of that grease and bread will soak up any remainig alcohol in their system. Trust me they will love it! These are a just a fun few ideas to help your guests feel like true Charlotteans at heart! Want more great ideas about all things weddings? Contact Magnificent Moments Weddings, we would love to help you plan your event!